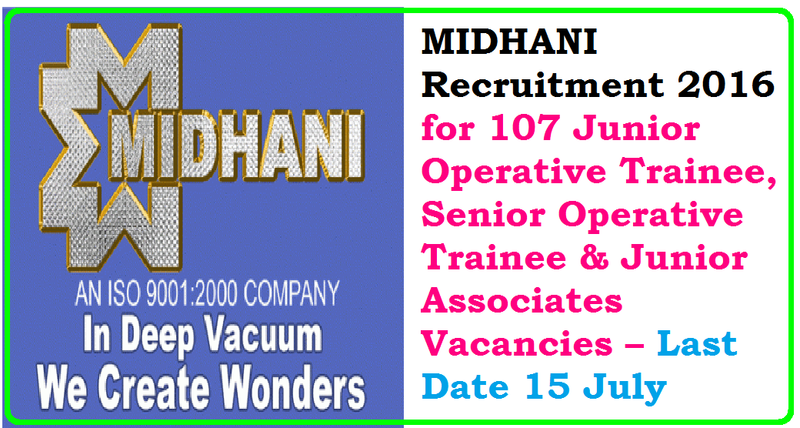 Mishra Dhatu Nigam Limited invites application for the post of 107 Junior Operative Trainee, Senior Operative Trainee & Junior Associates. Apply before 15 July 2016 . For Junior Operative Trainee : SSC plus ITI with NAC and 7 years experiemce in SSC /ITI with NAC or Equivalent. For Senior Operative Trainee : Diploma in relevant Engineering(Mechanical/ Metallurgy/ Civil/ Electrical/EEE) with 60% marks with min. 2 years post qualification industrial experience in the relevant area. For Junior Assistant : Graduattion with with relevant certificate course in PC Operation (MS office) from reputed/recognized institution or Degree having PC operation (MS Office) as one of the subjects is essential with minimum 2 years post qualification experience in relevant area. Selection Process : Selection will be made on Written Test, Practical & Trade Test. Application Fee : Candidates have to pay Rs. 100/- through the Online Payment Only by using Net-banking/ Credit card/ Debit card;. SC/ST/PWD/Ex-Servicemen are exempted from the payment of fee. How to Apply MIDHANI Vacancy : Interested candidates may Apply Online through the Website http://www.midhani.gov.in/ from 25.06.2016 to 15.07.2016.